Now that Spring is here, the arrival of warmer weather and longer days means many Texans are spending more time outdoors enjoying and caring for their lawns. Mowing seems like the most basic and simple of all outdoor chores. But cutting your grass correctly will help keep it healthy, conserve water, save money, and reduce the need for fertilizers and pesticides. Mow like a pro with these seven tips. How often you mow is the most important aspect of lawn care. Mow frequently enough so that you remove no more than one-third of the grass blade. A slightly taller blade shades the soil, holding in moisture. It also prevents weed growth. When grass is growing slowly, such as during drought, raise the mowing height and mow less often. If your grass is growing quickly, mow more often but never remove more than 30 percent of the blade. Keep your mower’s blades clean and sharp for clean cuts and better performance. Lawns cut with dull blades lose moisture faster and are more prone to disease. Leave grass clippings on the lawn after mowing. Besides personal preference, there is no reason to remove them. They recycle nutrients and water back to your lawn, improve the topsoil, and significantly reduce the need for fertilizer. If you decide to remove the clippings, put them in the compost bin. Mow over leaves so that they will decompose along with the grass clippings. Consider using mulching blades/kits to shred clippings and leaves as you mow. Change your mowing pattern regularly to evenly distribute grass clippings and prevent ruts or irregular growth patterns. To learn more, visit TakeCareOfTexas.org. 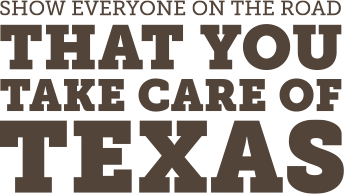 Pledge to do your part to Take Care of Texas, and we’ll mail you a Texas State Parks Official Guide.